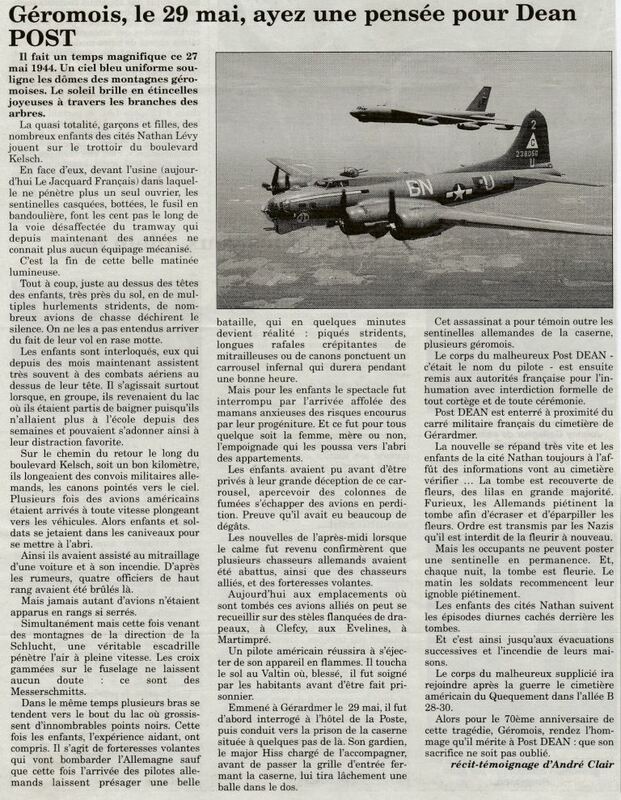 A French newspaper article about Lieutenant Dean N. Post, Jr. (1921-1944), who was killed in action in France during World War II. Lt. Post was a pilot from Tampa, Florida, who served in the U.S. Army with the 357th Fighter Group of the 264th Fighter Squadron. His airplane crashed in Martimpré, on May 27, 1944, and he was executed by German authorities after being hidden by French citizens in Gérardmer. Lt. Post is buried at Epinal American Cemetery and Memorial in Dinozé, France. Digital reproduction of original newspaper article: L'Echo Des Vosges, May 29, 2016. Originally published by L'Echo Des Vosges. Copyright to this resource held by L'Echo Des Vosges and is provided here by RICHES of Central Florida for educational purposes only. "Crash du P-51 Mustang - type B-10-NA - s/n 42-106632 C5*?" Franch-Crashes 39-45. http://francecrashes39-45.net/page_fiche_av.php?id=2675. "Missing Air Crew Reports." fold3.com. https://fold3.com/image/28628684/?terms=Dean%20Post. Frommer, Jean-Loup. 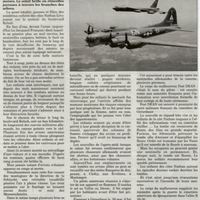 "1st Ltt Post N. Dean Jr." Aérostèles. http://www.aerosteles.net/stelefr-gerardmer-post. “Géromois, le 29 Mai, Ayez une Pensée pour Dean POST.” RICHES of Central Florida accessed April 19, 2019, https://richesmi.cah.ucf.edu/omeka/items/show/6925.